On a day designed for lingering, honoring and enjoying, the Cardinals and their fans bid farewell to their downtown St. Louis home. 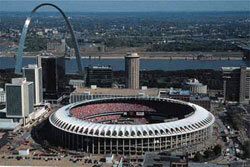 Ten years ago, on Oct. 2, 2005, the Cardinals played their final regular-season game at Busch Stadium II. Six months before they would begin play in a new downtown ballpark, the Cardinals rallied to beat the Reds, 7-5, in a game that took 3 hours and 11 minutes to complete before a crowd of 50,434. After the game, the Cardinals conducted a two-hour ceremony that honored the players and personnel who had been a special part of Cardinals baseball at Busch Stadium II from 1966 to 2005. Early on, it appeared the Reds might put a damper on the day. In the third inning, Felipe Lopez, Adam Dunn and Austin Kearns hit consecutive home runs off starter Matt Morris and the Reds had a 5-1 lead. “It wasn’t the start I would have pictured, the storybook ending type of deal,” Morris told the Post-Dispatch. The Cardinals rallied against starter Brandon Claussen, scoring three in the fourth and two in the fifth for a 6-5 lead. Several players contributed to the comeback win. Mark Grudzielanek had three hits, a RBI and scored a run. Reggie Sanders, Yadier Molina and Abraham Nunez each had two hits, a RBI and a run scored. Cardinals manager Tony La Russa used nine pitchers. Brad Thompson earned the win with an inning of shutout relief. Jason Isringhausen pitched a scoreless ninth for the save, giving the Cardinals their 100th win of the season. The Cardinals left 12 runners on base; the Reds stranded 11. In the ceremony that followed, former players, coaches and managers were introduced by decade, starting with the 1960s. Among those appearing on the field were present and future Hall of Famers Lou Brock, Steve Carlton, Bob Gibson, Whitey Herzog, Red Schoendienst, Ozzie Smith and Bruce Sutter. Stan Musial sent word that he wasn’t feeling well and was unable to attend. Others receiving big ovations when introduced included Jack Clark, Vince Coleman, Keith Hernandez, Tommy Herr, George Kissell, Willie McGee, Mark McGwire, Mike Shannon and Ted Simmons. Shannon had thrown the ceremonial first pitch to Schoendienst. “This is the place that gave birth to me and the chance to be the player I was,” Coleman said to MLB.com. Tributes were made to the deceased who had played prominent roles at Busch Stadium II. They included Ken Boyer, Nelson Briles, Jack Buck, Curt Flood, Joe Hoerner, Darryl Kile, Roger Maris and Darrell Porter. The stadium remained filled with spectators as afternoon turned into early evening.